Take a moment to get to know Kelly, our Studio Manager. Join her for her gentle and grounded classes: Hatha & Meditation 6:30-8:00pm on Tuesdays, Hatha & Yoga Nidra 10:45am-12pm on Wednesdays and Fridays, and Kirtan on Fridays once a month come the Fall. 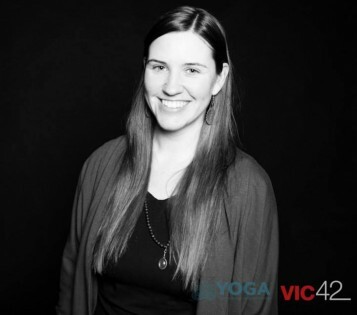 I began practicing Yoga in 2001 while I was in University and a bundle of stress. I was drawn to practice Yoga and Meditation to manage my busy mind. 2. How has Yoga helped you in your life? Yoga has helped me to create space; space between my thoughts and in my body. Regular practice has also helped me create space where I least expected it – between my reactions and myself. Yoga has helped me step back and witness the big picture with compassion. I teach classical Hatha Yoga which includes – asana (for body), pranayama (for breath), meditation, and Yoga Nidra. I also offer Kirtan – joyful singing of mantras in call and response! 4. What can students expect from your class? Students can expect to be welcomed as they are. My classes often include mantra, an emphasis on the breath, and space between postures to observe the experience. I aim to offer a peaceful, quiet, and nurturing space for students to unravel from tension. 5. How do you support beginners in your class and emphasize their safety? I love teaching Yoga to beginners and feel that every body can benefit from some form of yoga. I use clear instructions, offer modifications when needed and encourage the use of props when appropriate. I’m also available before and after class to support students. I encourage students to listen to the wisdom of their body and honour limitations. 6. What advice can you offer students with a regular practice to take their practice further? Practice regularly. Practice often. Practice with compassion towards yourself. Yoga is not a linear experience. In order to develop as a student, one must be willing to start over again; to approach practice as if it’s the first time. To stay completely present is advanced yoga – no matter how simple the practice. 7. How do you take yoga off the mat? Majority of my Yoga practice is off the mat! On the mat is where I practice observing my breath, mind, and body. But it’s in the rest of my life is where I extend this awareness. When one of my teachers said, “Yoga is anything that you do with Awareness” it really resonated. This awareness helps me stay a little more present in my daily tasks, my conversations, my relationships, and my work. I look forward to a lifetime of refining this practice!